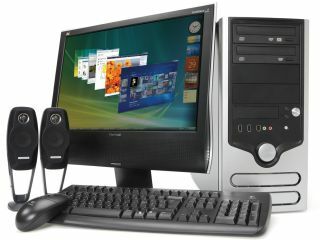 Evesham Technology is capitalising on the launch of Windows Vista today by launching a desktop PC that ships with the Premium Edition of the new OS. With a typical system price of £999, the Solar Storm packs a 2.13GHz Intel Core 2 Duo processor, 320GB serial ATA drive, a 16x DVD-ROM drive and an 18x multi-format dual-layer DVD burner. Vista's glossy Aero interface is powered by a 256MB Nvidia GeForce 7900GS and you also get 1GB of 667MHz DDR2 RAM and a 20-inch Viewsonic display. The Solar Storm also includes an analogue/digital TV tuner card, receiver and remote so you can make the most of Vista Premium's Media Center capabilities..
Other goodies include a Logitech cordless keyboard and mouse, plus a set of Creative I-Trigue 2.1 speakers comprising two desktop squatting satellites and an active sub. The Solar Storm is also backed by a three-year Gold warranty from Evesham.